With the possibility of a fire disaster always a terrible possibility, I think it is extremely important that we keep our most important papers and photographs etc. in a SentrySafe Fire Safe. What drew me to this particular model is that it is both portable and attractively priced so I can feel more secure without having to invest a fortune. The SentrySafe Fire Safe is designed for standard fire protection which provides “1/2 hour at 1550 degree F” and “verified fire protection of digital media”. It is accessible via a key lock and your set will include two keys for entry. This SentrySafe Fire Safe was designed to be contoured and ergonomic so it is very comfortable to carry and transport as needed. What do I keep in my SentrySafe Fire Safe Chest? In the roomy interior, I keep our birth certificates, hospital records, insurance papers, passports, photographs, digital files, tax paperwork and emergency contact information. There is still room within it to add additional items as needed within it making it a very practical fire safe that isn’t going to take up a lot of room (we store ours in the closet). SentrySafe has a wide range of home protection products available to fit virtually all of your fire safe or safety needs for both the home and office. My husband has had his eye on the SentrySafe Gun Safe to keep his antique guns safely locked away and stored. There are also Compact Safes, Key Safes, Safeboxes and much more to choose from at SentrySafe. You are invited to visit the SentrySafe website to choose the right products to protect your valuables. There is a handy online guide to help you select the perfect fit for the items that you want to protect and under what conditions that I find to be very helpful. The SentrySafe Fire Safe is available for purchase at major retailers in the United States and Canada and online i.e. Walmart, Staples, Canadian Tire and many more. Connect with SentrySafe on Facebook. Definitely an investment worth having. Great to know there’s options out there that have a reasonable price. Most of the one’s I’ve found are a bit crazy. 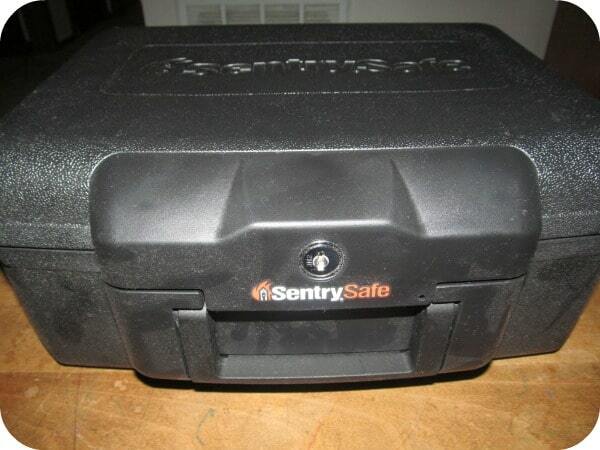 We have two Sentry safes and love them. They are very sturdy and well worth the money to know your valuables are always safe. This looks exactly what I need in our house for all those various items that we would need protected. Great review! I keep saying I have to get one and still have not, I had no idea that they are not all that expensive. I have thought many times that I should get one of these, but I have never gotten around to it. Fire is one of my greatest fears and I do need to get something like this. Wow this is the coolest thing I have ever seen! What a great idea to put valuable documents in in the case of a fire. I definitely need to buy one of these as well as let my family and friends know about it! Thanks for posting! Thank you the post. This got me thinking. We definitely could use one of these. I have a Sentry safe and I love it. I’ve been saying for SO LONG that we need to get one of these. I think it’s time to bite the bullet. We’ve been in the market for a safe, so this really helps. Thank you! I have one of these safes and I have to tell you that I am so glad because I feel safer knowing that I have my important papers in a secure location with it locked, and if there is a fire, my papers are safe! We just bought one of these and I am really glad we have it! Definitely a must have! I keep saying I’ll get one but haven’t yet; I need to get on it. Thanks for the review. I received the Fire File-HD4100L model safe as a Christmas present two years ago, which replaced a very flimsy model of another brand. I love this safe and feel completely comfortable leaving my valuable papers in it as it is fire proof and water proof. Having lost important papers before from water damage, I have every faith in the world in this safe. A very good product to buy just to be safe! Great review. A product everyone needs. i always wanted one of those big ones built in. i have a friend who has one, and many yrs ago, a friend’s father built one into her aptmt closet. i have 2 of the small ones, but they dont hold very much. wish the big ones were not so heavy, b/c i need someone to help me load it and unload it.